You are here: Home » Peace From PSP Teen’s Point of View – D3 Style! With a full group for two days teens at PSP’s D3 program created a Peace Poster for the Lion’s Club International Peace Poster Contest. This year’s theme is “Our World, Our Future,” asking for teenagers to visualize a culture of peace from their perspective. Because of the deadline for the contest we set the teens up to go through the D3 process one time quickly, submit a final prototype for the contest, and then on our own timeline revisit the Peace Poster from the beginning of the D3 process and create a final product without some of the contest constraints. We did apply our own constraints, however. 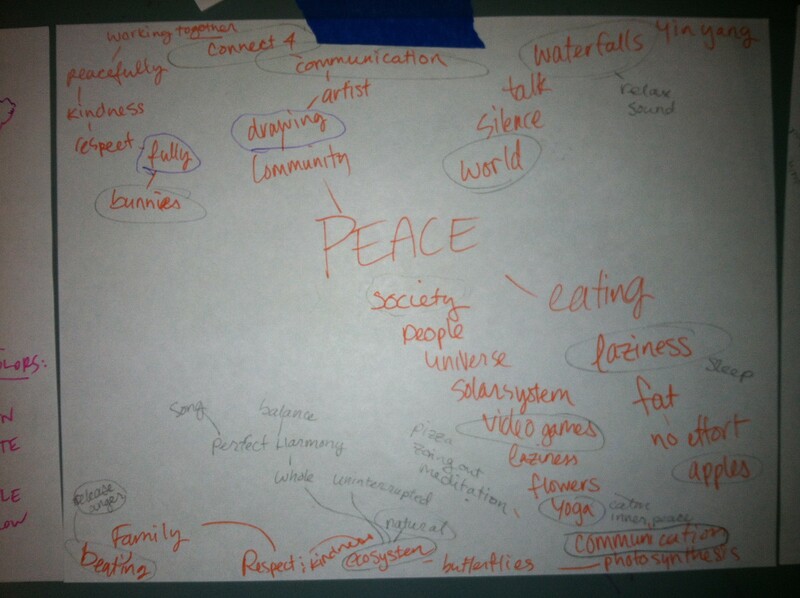 In Digging Deeper the teens brainstormed all of the images of peace that first came to mind: peace signs, hearts, open hands, doves, flowers, children/people holding hands in a circle, etc. One teen looked up the definition of ‘cliche’ and they decided that was not what they wanted their poster to be like! So, we applied that as a constraint for the poster. How do you get away from what is so obvious? By taking each cliche word one at a time we played a mind mapping game of free association: the facilitator says the cliche word and the teens say the first thing that comes to mind, continuously until we find ourselves either way far away from or back at the starting word. Then we start again, and do this idea expansion process until the page is full of ideas. Here we saw some commonalities come up amongst the different cliche word associations: community, ecosystem, dance, musicians, society, recycling, and lazy. To Define It we worked on visualizing some of these words. 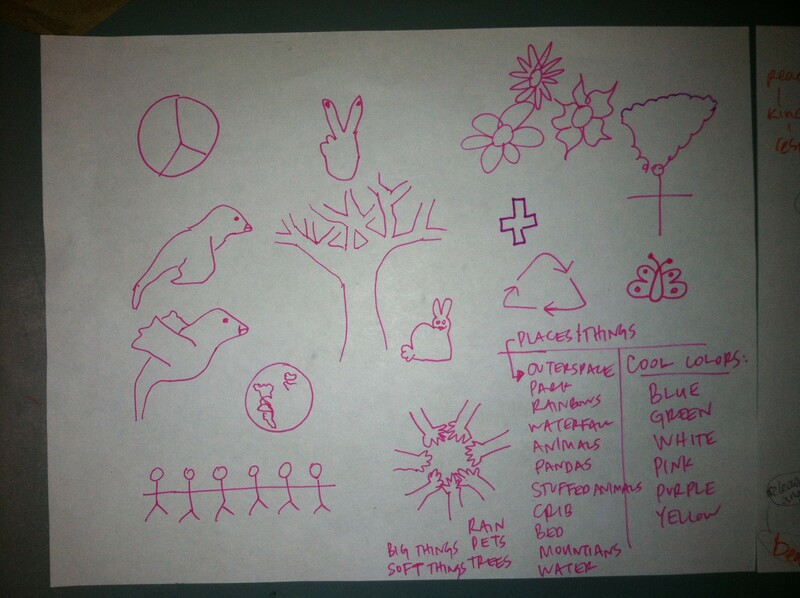 Each teen had a big sheet of paper and drew the same words in their own way: car, dance, breakdance, communication, food, yoga, ecosystem, harmony, then walked around the room to see how differently everyone visualized the same words! To design one poster to submit the teens decided that they would work in groups to create a series of changing Earths to show that peace is a process and will take lots of people working together to clean up our world and make it a better, peaceful place. Four Earths were sketched out in the Plan It Out step and these sketches were presented to the group as a whole and critiqued. Then once all the final sketches were agreed upon the teens got to Do It! With all new acrylic paints, brushes, sponges, and poster board the teens mixed colors and created their final Peace Poster. PSP associates and the representative from the Lion’s Club were very impressed with the final prototype submission. The teens worked so well together and really got their ideas on the same page. Now that their contest submission is done we will critique the prototype next week and dig deeper into how they can improve the communication of their story without any size or material constraints!